The CTSI and its Clinical Research Center collaborate with teams that provide specialized services and expertise for clinical research in specific disease areas and populations, and with venues and partners across the state, including the OneFlorida Clinical Research Consortium – a statewide partnership led by the UF CTSI in collaboration with the University of Miami, Florida State University, health care systems, health plans, providers and patients throughout Florida – as well as UF clinical research facilities in Jacksonville, Orlando and the Malcom Randall VA Medical Center. Co-located with the CTSI in the Clinical and Translational Research Building, the Institute on Aging (IOA) is dedicated to improving the health, independence and quality of life of older adults. 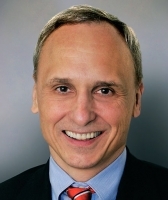 Led by Stephen Anton, Ph.D., the IOA’s Division of Clinical Research and its UF Older Americans Independence Center Clinical Research Core provide infrastructure and resources for conducting clinical research, including controlled trials, observational studies and epidemiologic studies. The UF Health Cancer Center includes more than 250 researchers and clinicians who provide cancer care and conduct research for the prevention, early diagnosis and treatment of cancer. The UF Health Cancer Center’s Clinical Trials Office provides support to Cancer Center investigators for the development and implementation of cancer clinical trials, including coordination and administrative support for the center’s scientific review process and Data and Safety Monitoring Board. 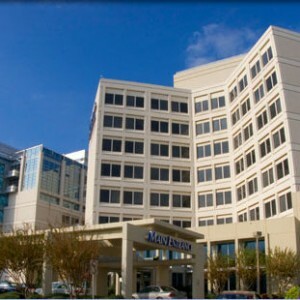 The Cardiovascular Clinical Trials Office facilitates a large number of short- and long-term clinical trials involving the use of new pharmacotherapeutic agents or new therapeutic strategies for the treatment of myocardial ischemia or chest pain, hypertension, heart attack, heart failure, peripheral arterial disease and arrhythmias. 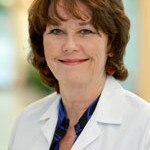 It is led by program director Eileen M. Handberg, Ph.D., ARNP, BC, FAHA, FACC, and is the UF Regional Clinical Center for the NHLBI-sponsored Cardiovascular Cell Therapy Research Network. The UF College of Dentistry’s Dental Clinical Research Unit provides resources for dental investigators and collaborators. Services include assistance with in vitro studies, pharmacology, microbiology, diagnostic methodology and data management. The unit is staffed with study coordinators and dental assistants with expertise in clinical study development and implementation. Led by Robert Burne, Ph.D., it is located on the first floor of the dental school and has multiple operatories, a lab and a conference area. 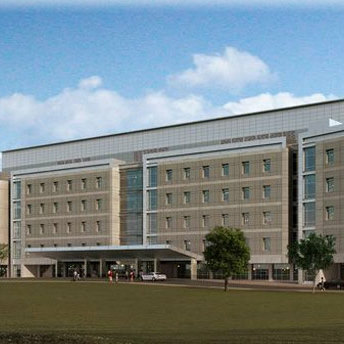 The UF Clinical Research Center serves as a venue for UF Diabetes Institute pediatric and other studies. 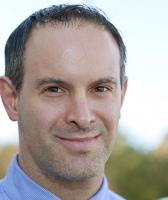 Diabetes research teams are co-located in the Clinical and Translational Research Building, and Desmond Schatz, M.D., serves as medical director of the UF Diabetes Institute and director of the UF Clinical Research Center. The UF Clinical Research Center serves as a venue for the Division of Gastroenterology, Hepatology & Nutrition’s GI/liver clinical research unit, which focuses on GI cancer, inflammation, liver disorders/ virology, nutrition/ metabolism and clinical investigation. The unit makes unique patient populations and tissues available to the research community and provides resources for investigators including consultations and research personnel. The liver research team is co-located in the Clinical and Translational Research Building. The UF Clinical Research Center serves as one of two locations for the Pain Clinical Research Unit, which is part of the multi-college UF Pain Research and Intervention Center of Excellence (PRICE). 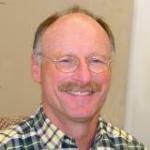 The Pain CRU is led by Joseph Riley III, Ph.D., and includes six fully equipped psychophysical testing units. The Pain CRU provides services including consultation on the design and implementation of pain assessment protocols into research studies and the collection of psychophysical pain assessment data. 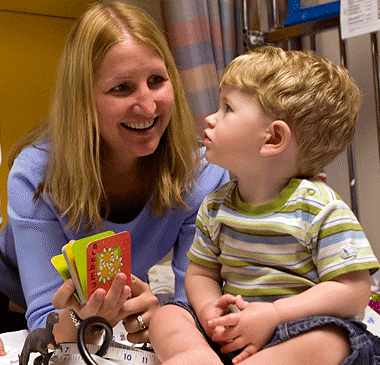 The UF Clinical Research Center serves as a venue for Department of Pediatrics studies, with approximately 30 percent of CRC studies enrolling participants under the age of 18. 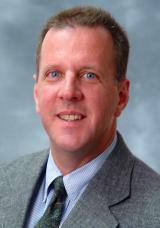 Barry Byrne, M.D., Ph.D., is the department’s associate chair for research and is co-located in the Clinical and Translational Research Building. 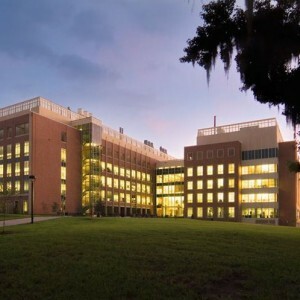 The UF Clinical Research Center has a long history of serving as a venue for and facilitating clinical research studies focused on rare and genetic diseases, including Pompe disease, Duchenne muscular dystrophy, glycogen storage disease, alpha-1 antitrypsin deficiency, Prader-Willi syndrome, genetic mitochondrial diseases and more. Several research teams focused on rare and genetic diseases are co-located in the Clinical and Translational Research Building. 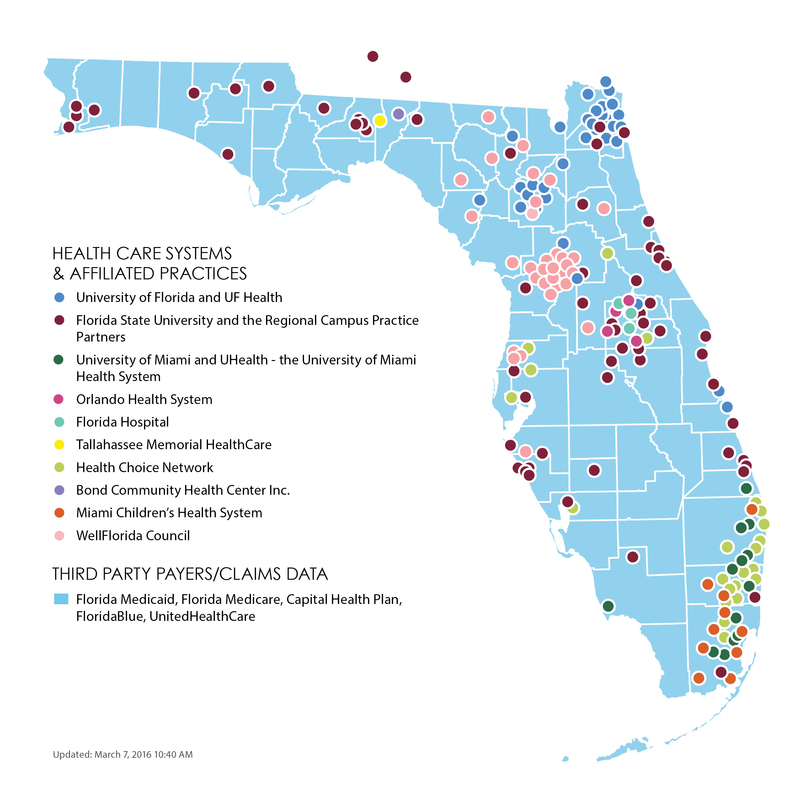 The OneFlorida Clinical Research Consortium is a statewide partnership led by the UF CTSI in collaboration with the University of Miami, Florida State University, health care systems, health plans, providers and patients. 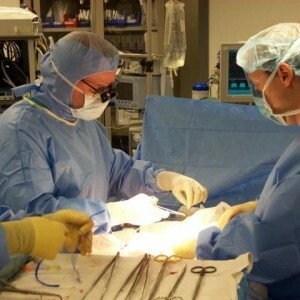 It includes 22 hospitals, 914 clinical practices and 4,100 physicians, providing care for close to 40 percent of Floridians. The consortium is developing a complex and robust research infrastructure that allows researchers, clinicians, patients and stakeholders to join forces across the state and with national collaborators through the NIH CTSA and PCORI PCORnet networks. To facilitate clinical research at UF Health Jacksonville as well as in the broader Jacksonville community, the CTSI partners with the UF College of Medicine-Jacksonville’s Office of Research Affairs, the UF Center for HIV/AIDS Research, Education and Service, and the UF Center for Health Equity and Quality Research. 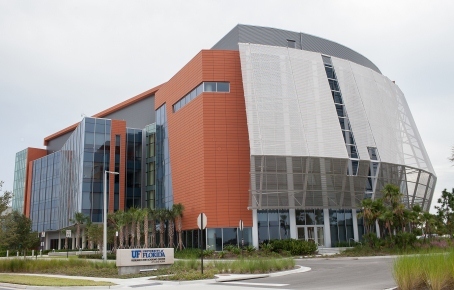 The UF CTSI shares research facilities in the UF Research and Academic Center at Lake Nona near Orlando, Fla. Facilities include exam rooms, meeting space, faculty offices and reception. College of Pharmacy facilities include extensive classroom, meeting room and auditorium spaces. Additional floors house laboratory and office spaces. CTSI investigators collaborate with the UF-affiliated North Florida/ South Georgia Veterans Health System (NF/SGVHS) and the Malcom Randall VA Medical Center in Gainesville. NF/SGVHS research centers include the Brain Rehabilitation Research Center, Center of Innovation on Disability and Rehabilitation Research, Geriatric Research Education and Clinical Center, and the National Center for Occupational Health and Infection Control. Learn more about conducting research at the NF/SGVHS.